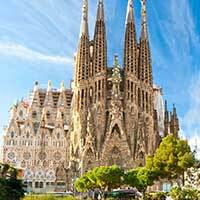 Looking for a cheap ticket to Barcelona? Here you can search all major low-cost airlines for cheap flights to Barcelona–El Prat Airport (BCN). The Barcelona–El Prat Airport is located 12km from the Barcelona city center. A taxi from Barcelona–El Prat Airport to Barcelona center would cost EUR 35.00. Before you book a flight you can use Utiket to find the cheapest flights to Barcelona for British Airways (BA), Vueling (VY), Lufthansa (LH), Air Europa (UX), Ryanair (FR), Iberia Airlines (IB). All flight data are real-time and accurate. Follow the links to search and book your cheap ticket to Barcelona directly with the airline or one of our partnering travel agents. Barcelona El Prat International Airport is located 12 km southwest of Barcelona city center and is the second largest Spanish airport and seventh busiest airport in Europe. The airport is a large hub for low-cost airlines like Vueling and Ryanair and also a main hub for Iberia. Although there are intercontinental flights to the America's and Asia, most flights are European mainly due to the growth of low-cost airlines: Vueling and Ryanair together count for almost half of all passenger traffic. Read more about Barcelona–El Prat Airport. This is a list of all airlines flying to and from Barcelona and how many flights and destinations they serve. You can see a complete list of airlines and flight options to Barcelona. Need place to stay in Barcelona?